Veronica Lake’s career never recovered after the backlash following the release of The Hour Before Dawn (1944). Lake's role as a Nazi spy and sympathizer did not resonate well with patriotic American audiences. Considering Lake's two previous films were successful morale boosters (Star Spangle Rhythm and So Proudly We Hail), it's a wonder why Paramount Studios released such a risky film while the wartime efforts were still underway. Despite trying to take a more serious approach to her career, Lake quickly discovered the golden age of Hollywood was notorious for chewing up and spitting out their own. Even though she had a contract with Paramount, Lake's box office draw continued to decline. At the age of 26, Lake was already past her career prime. 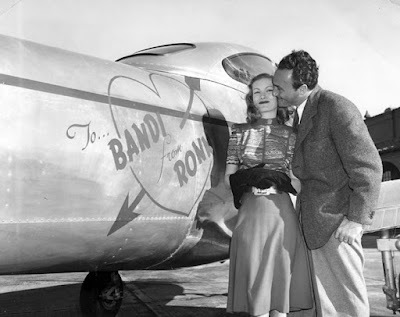 To help keep herself occupied between films she decided to get her pilots license. Shortly after her marriage to Andre DeToth, she had bought her second husband a Navion airplane for Valentine's Day. In a hobby primarily dominated by men, Lake was one of a handful of women who achieved her aviation license for leisurely recreation in the ‘40s. As the decade came to an end Lake continued her efforts to resurrect her career without success. The few parts she did manage to get were only supporting roles. With little success and long stretches of down time she turned to alcohol. While intoxicated she often became very bitter with the industry. She believed it was all a sham, and was not afraid to share her opinion if others were around. Unfortunately DeToth did little to comfort his wife or encourage her to seek help. In 1948 Lake gave birth to her second child with DeToth, a daughter named Diana. Weeks before Diana's birth Lake’s mother sued her for support payments. Lake began sending money to her mother when her career took off, but as her career began to tumble, her income dwindled as a result. The lawsuit between Lake and her mother drove a deeper wedge between an already stained relationship. The two settled outside of court. As a new decade rolled in Lake was unable to find a role in Hollywood. After fulfilling her contract with Paramount, 1950 came and went without Lake appearing in a single movie. This only furthered her resentment with the industry. She starred in one movie in 1951, an American-Mexican historical drama titled Stronghold. The film was not well received, and even Lake described the movie as “a dog.” Stronghold ended up being a financial disaster. Lake and several cast and crew members had to sue the production for unpaid wages. Things went from bad to worse when Lake and DeToth filed for bankruptcy a month later. It all came crashing down for the couple when the IRS seized their home for unpaid taxes shortly after. With new comers such as Marilyn Monroe and Elizabeth Taylor emerging as the next big stars, Lake made up her mind to leave Hollywood for good. A decade in the industry was enough. In her autobiography she was adamant she never had a second thought about leaving. "They said, 'She'll be back in a couple of months,' Lake recalled. 'Well I never returned. Enough was enough already. Did I want to be one of the walking dead or a real person?'" So Lake left it all, leaving behind her career, her husband, and all of her children. In extraordinary fashion she loaded up a few belongings on the plane she had purchased for DeToth and flew solo from Los Angles to New York. There were no fond farewells, no best wishes or good luck, not even a resentful goodbye. Lake just took off into the sky and never looked back. DeToth filed for divorce and custody of their children the following year. Lake signed the papers with out protest and was done. True to her word, she never returned to the industry. And just like that, at the age of 29, Veronica Lake and her Peek-a-Boo bang seemingly disappeared all together.